Three men who admitted their part in running a large scale cannabis factory in Wiltshire, are due to be sentenced. They ran the factory from an underground nuclear bunker - its yield was estimated to be around £1 million. The men appeared at Swindon Magistrates charged with drug and slavery offences. 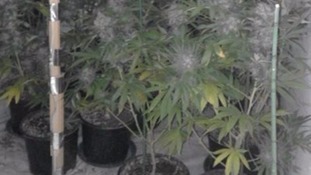 Police are looking for a man in connection with what is believed to be the biggest ever cannabis factory found in Kent. Officers uncovered the operation in August of this year, with around 6000 cannabis plants being found at the derelict building in West Hill. The street value of the drugs was £4 million. Officers believe the man they want to talk to uses the name Stefan Nardi, claims to be 37-years-old and Italian. He is also thought to have links to the Deptford area of London. Over 100 cannabis plants are due to be destroyed after officers shut down a cannabis cultivation in Maidstone.